Manny “Pacman” Paquiao is simply phenomenal in all his fight. He had won six-time world champ in five weight divisions (WBC flyweight title, IBF superbantamweight title, ”The Ring” featherweight title, WBC superfeatherweight title, WBC lightweight title) and sealing once more his reputation last Saturday as the victor for pound-for-pound boxer, the new IBO Light-Welterweight title holder of the world! I am not a boxer expert that can tell you Pacman’s technique and his greatest weapon. I’m just a ordinary fan of Pacman, and seen his ONE of his greatest weapons in his games, that is PRAYER. Look at the pictures below. 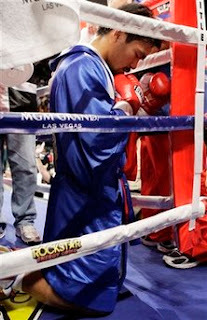 Putting God’s first by offering a prayer before the fight. Hello webmaster. I like your blog about Life Ascending » Blog Archive » Pacman’s Greatest Weapon. But i have a question totaly off this subject: Do you use a seperate blogposting platform or do you write your blogs in the wordpress admin? If you post your answer below mine,then i will read this in the next couple of day’s. Yes in the wordpress admin. Before, this blog is in blogger platform and I used Windows Live Writer in posting.